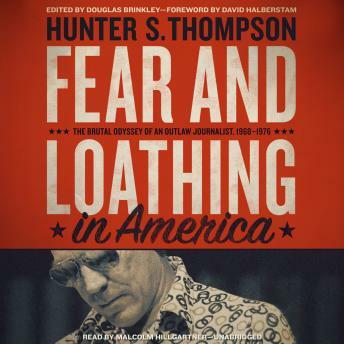 Spanning the years between 1968 and 1976, these never-before-published letters show Thompson building his legend: running for sheriff in Aspen, Colorado; creating the seminal road book Fear and Loathing in Las Vegas; twisting political reporting to new heights for Rolling Stone; and making sense of it all in the landmark Fear and Loathing on the Campaign Trail ’72. To read Thompson’s dispatches from these years—addressed to the author’s friends, enemies, editors, and creditors and such notables as Jimmy Carter, Tom Wolfe, and Kurt Vonnegut—is to read a raw, revolutionary eyewitness account of one of the most exciting and pivotal eras in American history. I have recently become interested in Dr. Hunter S. Thompson, this is a great representation of how interesting of a person, and talented of a writer he was! it also gives a very good look at the publishing world and how challenging a river of complexities it was, and probably still is, to navigate for any writer/journalist! l enjoyed it very much, although it was not what I expected!......C.K.